Last month I bought an ice cream maker and well, I’ve been obsessed. All I think about is what kind of ice cream I should make next! The first batch was a custard based vanilla. Awesome. Next batch was strawberries and cream. Outrageous. Then it was chocolate. Ridiculous. There is something pure and simple about all of them that make them so good. The family is now officially on a dairy overdose so today I decided to switch it up. After finding a simple recipe on a great food blog, we rounded up a few strawberries and raspberries that we had in the fridge. In a saucepan over medium high heat, place all the ingredients into the pan and bring to a quick boil. Reduce the heat to low and simmer 10 minutes. Remove from the heat and let the berries cool completely. 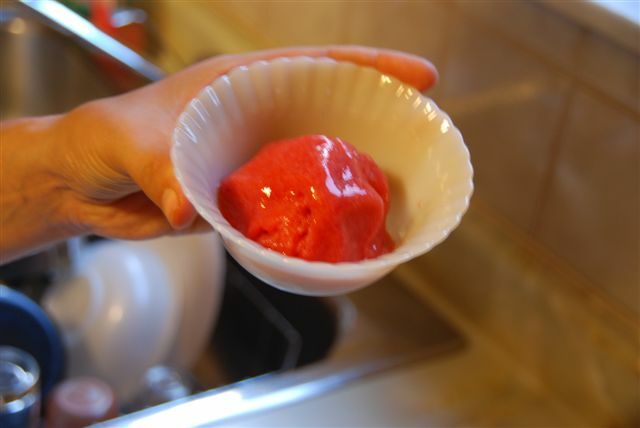 Puree until smooth in a blender or food processor and then strain through a fine strainer. Process in your ice cream machine according to the manufacturer’s instructions. The whole ice cream making experience has been interesting. There’s a definite learning curve. I’m also learning that there are so many possibilities and combination of flavours. Enough to keep me busy for a really long time…and justify why I felt it necessary to purchase a piece of kitchen equipment that only makes one thing.